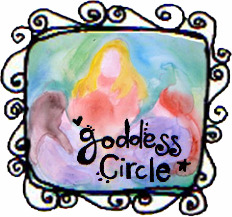 This year, I'm participating in Leonie's Goddess Circle, an online forum that is way more than a forum. For a set price ($99/year), you get access to a forum full of beautiful, interesting women from all over the world, plus (and this is a huge plus!) access to Leonie's fabulous 2011 Workbook and all of her e-courses and other goodies, such as the Creative Goddess e-course, Creating Your Goddess Haven e-course, Divine Dreaming Meditation Kit, among others. It's an amazing deal for all the fabulous things you get. One thing I love about belonging to a forum like this, is that it can provide wonderful support for various aspects of life, from business to the personal. And one one thing I've learned about myself is that I thrive when I have wonderful support systems in place with like-minded souls. The forum has sections for accountability, support for your growing business, a book group (they're doing The Artist's Way now), and others. I'm particularly excited about the section for mothers, as I love gathering wisdom from other women who are going through or have been through the process I'm in the middle of now. For those of you who don't know Leonie, she is an amazing woman, new mom, and business owner. I admired her work before I met her online and am glad to now call her a friend. She's sweet as can be and full of such beautiful fire and sparkling, creative energy. Seriously, the girl is a total inspiration! In the interest of full disclosure, the links I've provided are affiliate links, but I would 100% support Leonie's work without any added bonuses because I truly believe in her work. So if you feel called to do so, check out her Goddess Circle. 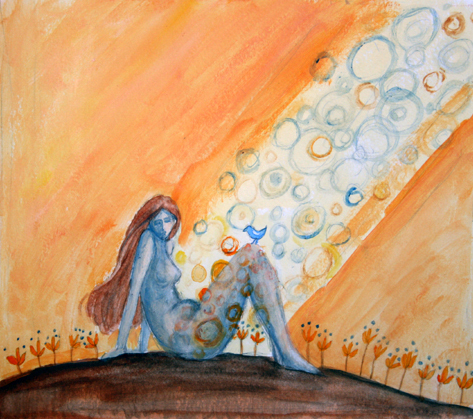 Or if you're looking to bring some focus to your year, check out her 2011 Creating My Goddess Year Workbook. If you're already part of the Goddess Circle, say hi to me there! 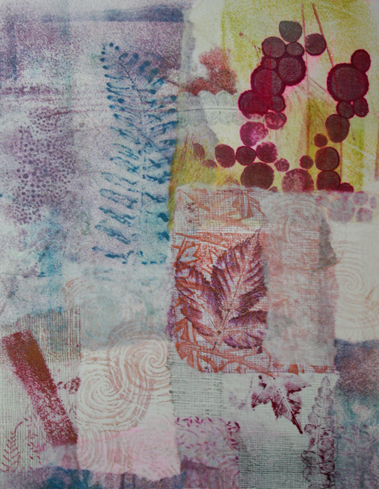 I've collaged together some rice paper prints of leaves and stamps that I made while in Judy Wise's class at Squam. Rice paper collages so beautifully! I plan to work with this image more, painting and/or drawing on top of it once it's dry. It definitely feels like fall and fits right in with the earth theme. By the way, make sure the top on giant containers of gel medium are closed before you carry them around. Yikes! What a mess! Thankfully, I couldn't help but laugh, scrape up what I could salvage and clean up the rest. 1. Today, I have a video up at SPRING, all about creativity, cycles and the beautiful community of Art Every Day Month. If you haven't checked out SPRING, please do. It's full of inspiration and this month the focus is all about creativity! 2. 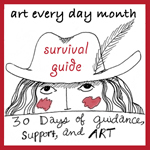 Art Every Day Month is right around the corner. It's a low pressure challenge that draws a great group of creatives every year. 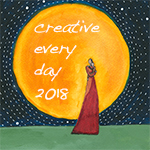 Your daily art could be jewelry, knitting, cooking, collage, drawing, anything else you can dream up or a great mix of lots of creative activities. I'll write more about it in the coming week, but you can read all about the process here and sign-up here. And if you want to join in, but would like a little extra support, inspiration, and daily prompts to keep you going, you can sign up for the Art Every Day Month Survival Guide here. 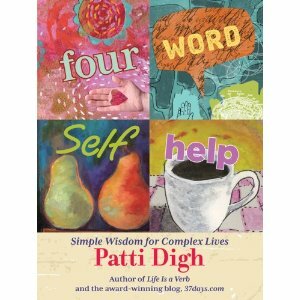 Yesterday, I got a copy of Four Word Self Help, Patti Digh's new book. 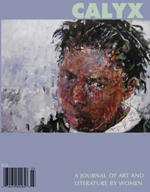 I got an early copy because I have a piece of art in it, along with many other wonderful artists from around the world. 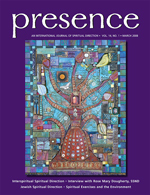 You can find my piece, "Let Others In" on page 3. What a beautiful little book this is! I also wanted to share Jess Larsen's website. She has started offering doula services in the Northern New Jersey area. I'm a big believer in what she does and was thrilled to have some of my work, including Spring Thaw (above), featured on her site. You can learn more about what she does as a doula here. I love a good laugh and this month of bliss has made me note where my laughter is coming from. 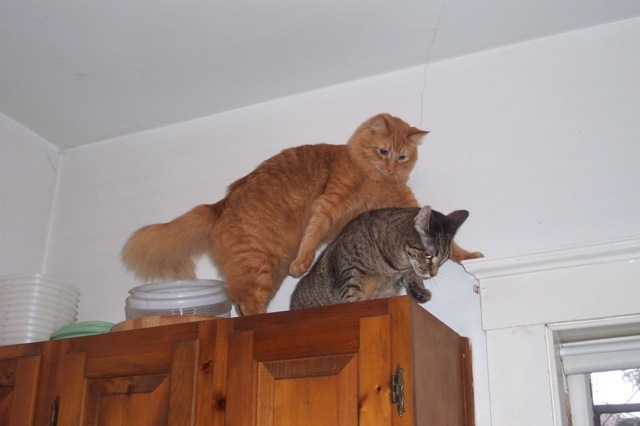 I find it in the ridiculously cute antics of my cats (like this oldie, but goodie above, of two of our kitties, Tabs and Sadie, being very bad on top of the kitchen cabinets in our old apartment), the fun photobooth session I had with the hubster that had me laughing so hard, I nearly peed my pants, and in the funny pictures and websites I spot online. So here are a few links (some funny, some interesting, some just because) that I thought might make you smile. Enjoy! *Catalog Living is a new to me site that totally cracks me up. I had a good laugh when I read this one. *I've known about Cake Wrecks for awhile now, but it's always good for a giggle, as is one of my favorites, I Can Has Cheezburger. *Andrea of ABCcreativity is offering a free Creativity 101 e-course, which you can sign up for here. *For my fellow Harry Potter fans, The Deathly Hallows trailer is out and it looks awesome!! So excited! *Lastly, I received an email this week from Liz Miller, who runs the Hope Notes project, which "invites anyone to create a card, write in a card, or simply donate a card that will be given to a client at Helpmate, a domestic violence agency serving Asheville, NC. The goal is to give each incoming client to the shelter and new support group members a card, a "Hope Note" that is empowering, encouraging and positive to keep them feeling supported and thought of while they transition." The cards will be on display at a fundraising benefit on July 15th, and attendees will be invited to write their own hope notes. You can learn more about the project here. I'll be mailing in some cards and I hope you will too. What a beautiful idea! Do you have any sites, links, songs, or videos that make you smile? Feel free to share in the comments! 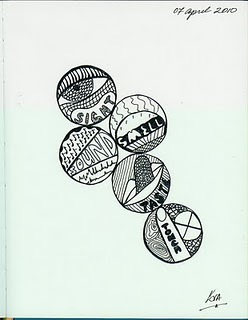 What are some of your favorite intuitive art resources? I thought I'd share some of mine and see if you guys had any to share too. And there are loads more books to read, but that's a start. I've taken a lot of classes on intuitive art making, including one with Aviva Gold. Every teacher has a slightly different approach, but I generally enjoy the process and like learning from different folks. I'd love to take a class with the fabulous Chris Zydel! 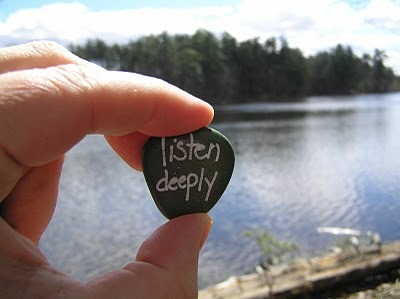 An old post about letting your art speak to you. Another old post about my painting of Ophelia, that started with a dream and continued as I followed my intuition. Every so often I feature the work of some of the amazing Creative Every Day Challenge participants. There's so much great work happening out there and we may not have time to get around to see it all, so I hope to share with you some work you might not have seen. I love the way you're all being inspired by the senses theme and I hope this work will inspire you to play with it even more this month! Kim Mailhot from Queen of Arts, created this hilarious and creative "Spring Walkabout" post, which I encourage you to read. Here's just one of the beautiful photos from her post. Julie Engelhardt, who blogs at She Dreams of the Sea, posted a picture of luscious berries along with this delicious poem. Yum. 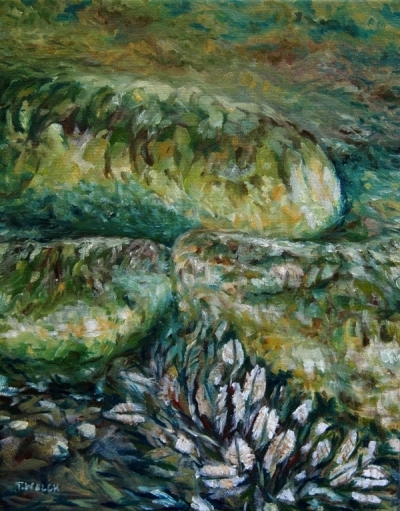 Painting "Rocks and Mussels," Terrill Welch of Creativepotager's blog, found herself remembering the "smell of seaweed, the salt air, and the roar of the surf." I feel like I can taste the salty ocean air when I look at it too! Susan Loughrin, from the blog Organicsyes, has been doing a project she calls, "A Melody a Day" and recording these melodies on video. Here's her most recent one, called River Song. Beautiful! So much beauty! Thank you all for sharing your creations with the world. You inspire me and so many others! Hey, everyone! I'm having fun with the senses theme and was inspired to make a little video, to play with the senses of sight and sound. 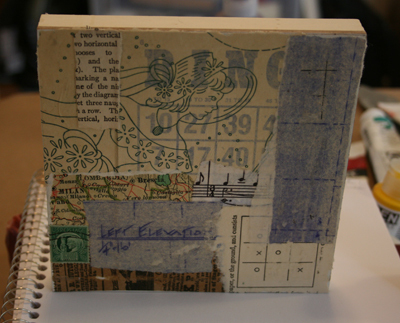 In this video, I show a few details of how I begin a mixed-media piece, along with some of the techniques and materials I use. I was rambling on a bit and I don't know how interesting it will be to watch, but I know I get a kick out of seeing other artists at work, so perhaps you'll enjoy a peek into my creating world! I've continued working on the collage since I finished the video, as you can see in the work-in-progress picture above, and will begin the painting part soon. I'm curious to see how much it will follow the original seed of an idea I had for it or if it will go in a new direction once I start painting! * Memory Walk: In November, I mentioned that my grandmother passed away after a long battle with Alzheimer's (that's her and I a long time ago...gotta love the footie pajamas.) 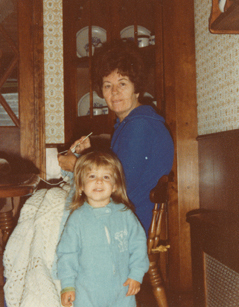 This fall, I'm going to be walking in her memory to raise funds for Alzheimer's Disease research. It's a terrible disease and I hope to make a difference. If you feel moved to sponsor me on my walk, you can do so here. As a thank you to those who donate, I will be randomly selecting one sponsor to receive a special piece of my artwork! * Kitty Art: I've got a couple new items in the shop, including some adorable Itty Bitty Kitty art pieces and brand new Itty Bitty Kitty Greeting cards! * Spring Sale: Through the month of April, you can use the coupon code spring2010 to receive 20% off your order of prints, cards, and original pieces in my shop. * UPDATE: The collage in the tutorial above, later became Bee Memories. I love the way the monthly theme worms its way into my brain and pops up everywhere. It may not always show up in my art, but it's always in my head. Just goes to show how the things we focus on really do expand in our lives. Which makes me wonder about what it is that I'm focusing on! Today, I've got some fun links to share with you before I go off to enjoy the sunshine. I truly can't get enough of walking in the woods lately. After the long winter, I've been so excited about the warmer weather, the sun, and oh, the little yellow crocuses! So precious! Life! Woohoo! Um, yes, I get a little excited about spring. One thing I can say about living in New England, it makes you reallllly appreciate the Spring when it starts to stretch its wings. - Thinking of the old stories we tell ourselves, reminded me of this post I wrote a couple years ago called, Digging Into Defining Beliefs. It was something I needed to read again today. - Martha Beck is one of my favorite authors on the topic of changing up your beliefs and this recent post from her blog is a great example of why. It's hilarious and super smart, great combo. I also loved her book Steering by Starlight , which I read and also listened to as an audiobook. - Have you heard of Jen Lee? I've had the pleasure of listening to an audio of her telling a story, and oh, she has a way with words! You can download a copy of her ebook, "the story catcher" here. - If you enjoy listening to stories, you'll love The Moth podcast! Well, that's enough links to send you down a few rabbit holes. Enjoy the stories and keep telling yours! p.s. The art above is titled, Fishing and is available here. 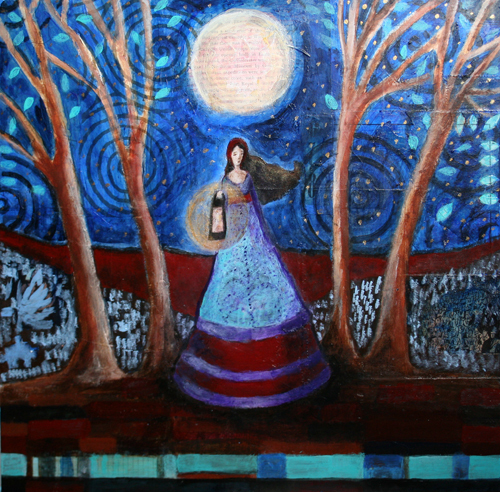 Over at Liv Lane's blog, Choosing Beauty, Liv is having a giveaway for a print of my mixed-media piece, Lantern. 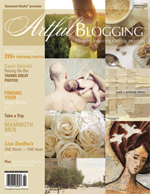 You can enter to win by leaving a comment on her blog by Friday 1/29 at midnight! I also love the question Liv asks with the giveaway, "What lights your way on your darkest days?" I answered the question in the comments and have been enjoying reading the answers from others! Liv is a fellow Creative Every Day Challenge participant, who also co-hosts a fabulous weekly radio show in Minnesota called Get Real, which I got to be a guest on last month! You can also be entered to win one of my prints every month by subscribing to my Blue Tree Art Gallery newsletter. The sign-up form for that is in the lower left corner of the site, where I offer original art, prints, greeting cards, and calendars featuring my work. 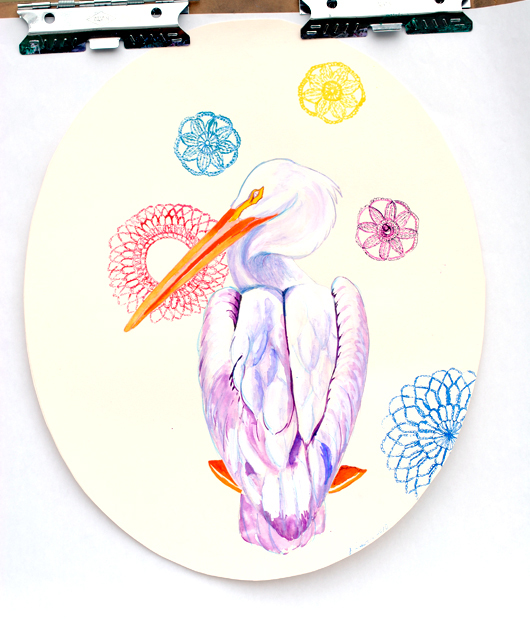 This month and next, you can also see my work on the beautiful online zine, All Things Girl. 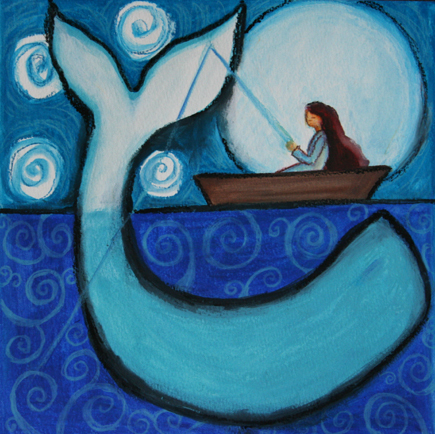 The theme this month is Through the Looking Glass and my pieces, Leap and Listening are featured. A big, heartfelt thank you to everyone here for supporting my growth as an artist. It means the world to me!